Prefab concrete steps give you an easy option for exterior stairs. These preformed stairs are durable yet easy to install. Made from steel-reinforced concrete, prefab stairs are one unit with all of the stairs molded in one continuous piece. They are made in a form in a factory and then shipped to the construction location ready to install. Most companies that manufacture prefab stairs have standard stock sizes for the steps. You'll also find the option to order custom-made concrete steps to fit your specific needs if the stock sizes won't work. You'll find that most prefab steps made of concrete have between one and seven steps. The corresponding heights range from about six inches to eight feet tall. This flexibility enables you to find a set of stairs that fit the specific height you need. The risers are generally between four and seven and a half inches. The tread depth commonly falls between 10 inches and 19 inches. Precast concrete steps are available both with and without a landing. Many companies even offer more than one size of landing. This gives you more flexibility to match your specific project needs. Concrete steps that are prefabricated are typically used outdoors. Most often they are used to lead up to a deck or to a front or back door. If your door is just slightly higher than ground level, one step will do. Taller doors and decks will need more steps. The concrete steps are hoisted into place on leveled ground. They are usually installed with concrete blocks at each of the four corners to support the weight. Prefab steps come as one unit with all of the stairs as one piece. This exterior stair option comes with several benefits. They are much faster to install than pouring your own concrete stairs or building wooden stairs. They are often less expensive than hiring a concrete company to pour steps on site. You won't need the foundation that is required for other step options. They are hollow, making them lighter and less likely to settle over time like solid concrete steps. If the stairs do happen to settle or shift, they are much easier to lift and put back into place. The stairs are one solid piece so they have more stability. The solid construction also eliminates mortar joints that can sometimes let water in. They are typically reinforced with steel rods. 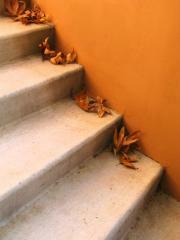 You'll find a variety of different finishes available on the concrete steps. Most have non-slip surfaces on the treads for safety. The prefab steps made from concrete don't have the maintenance needs of wood steps. Before you head to the store to purchase your prefab steps, take some time to consider what you need. Check the local building codes to determine the correct step sizes. Measure the area available at your home. The most common width for the prefab stairs is four feet, but there are wider options so you'll need to know how much space is available. You also need to know the height from the ground to the door or deck where the concrete steps will lead. Some home improvement stores sell the prefab steps. Also look for concrete companies that specialize in the precast steps. Check with the company to see if installation is included in the cost of the concrete steps. While the hollow structure makes them more lightweight than solid concrete steps, they are still very heavy. The company or an experienced contractor has the equipment to lift the steps into place, making the job much easier. Prefab concrete steps give you a quick solution when new exterior stairs are needed. The lightweight yet durable nature of these steps along with the ease of installation and maintenance makes them a good option for many homeowners.